Are you after birth chart astrology 9th house interpretations? If so, then you have come to the right place. The interpretations below can be used for both Western and Vedic (Kundali) astrology birth charts. Location on birth chart wheel: It is house number 9. Ruler: House rulers in Vedic astrology are not constant. They change according to the Lagna (Ascendant) of the person. Vedic chart location: It is house number 9. You are a very restless person who seeks out the truth in situations; this is why education plays an important role in your life. Your extremely curious nature makes you question subjects such as religion, law, and philosophy. Also, there is a desire to explore and travel, and, different cultures and lifestyles intrigue you. You are always on the move and looking for new experiences. Being very curious and philosophical, traveling may be a big part of your life one day, especially to foreign countries. As a child you may have learned many morals (right and wrong) and religious values, probably from your mother or her side of the family. You have a variety of interests and hobbies. And you enjoy sharing the knowledge you have accumulated on these subjects with others. You communicate in an optimistic and enthusiastic way, and have an interest in life and the world in general. Travelling the world is something you would love to do, meeting many foreign places and people, and learning about different cultures. You have many beliefs, ideas, and opinions, and enjoy sharing them, plus talking about subjects such as philosophy, law, and religion. While you may not pay enough attention to details, you are skilled at finding a quick solution to problems. You readily see the bigger picture, and enjoy sharing your opinions and ideas. Because you are interested in many subjects, school was not a problem. However, you were rather impatient when it came to studying. You are attracted to, or you tend to attract, people of different cultural backgrounds. You are attracted to partners who are enthusiastic and not afraid to have a good time but they must also allow you a certain amount of freedom. Throughout your life you have probably gone on many trips, traveling to different places that interest you. On these trips you will meet many people that you get along well with, even partners. Your hips and thighs may be especially attractive! Subjects such as religion, philosophy, and art may interest you. You speak to people in an honest way, sometimes being incredibly blunt. People love your sense of humor and open mindedness. Travelling may play an important role in your life, most likely connected to work. Also, you have a zest for life and love a good adventure or challenge. Outdoor sports are something you enjoy. You are attracted to partners who can make you laugh and don’t take life too seriously. You are sexually playful and energetic. You may be interested in developing your education. When it comes to travel, you are adventurous. Because you feel restricted and uninspired by your own place of birth or culture, you will likely travel overseas for long periods. You appreciate that much knowledge and wisdom can be gained through travel. During your childhood, you were exposed to religious teachings, probably from your parents. It probably had a major influence on your personality, and the spiritual belief is still valued to this present day. The belief you have is most likely a traditional one, as you do not accept new concepts readily. At some point in your life, you will probably question your belief system; this is because you were originally expected to believe without question. As you age, you will naturally question your beliefs and rethink them. Your journey of spiritual discovery may lead you to travel abroad, to discover new philosophies, and cultures; however, this travel is more likely to be linked with business pursuits. Education could also play an important role in your life, as it can help increase your understanding of the world. Seeking the meaning of life could be one of your life long goals. Any education can be challenging for you as you prefer a practical approach to learning; getting a job can be difficult too. Regardless of these problems, you are incredibly hardworking and thorough in your planning. You deal with problems in a systematic and practical manner. When it comes to absorbing knowledge, you are impatient, wanting to learn as quickly as possible or to do it at your own pace. This caused you many issues at school, which sometimes made you rebellious. However, as an adult you have more freedom to choose a different style of learning. You hate courses that have many irrelevant subjects; therefore it is likely you choose to learn specific subjects or skills. You like new ideas, especially ones that oppose beliefs, philosophies, and traditional views. Searching for religion may play a major part in your life; this may be carried out by visiting places of worship, taking courses, or just reading books. Also, you may travel to foreign lands to explore different cultures and ways of life. Religion and philosophies interest you, especially the eastern ones. Also, you are probably interested in spiritualism, psychic phenomena, reincarnation, and mysticism. Any travel you do is usually done for spiritual reasons; make sure you plan your trips well. You have a vivid imagination and probably have a natural talent for the arts. You are strong in your beliefs and will probably argue with anyone that opposes them. However, this would be a difficult task for anyone as your opinions are well researched and analyzed. Anything you learn will be taken to a very deep level of understanding. There may be a strong need for you to convert others to your way of thinking. If you believe in a God, then you likely believe he is a vengeful one. Did you enjoy these birth chart astrology 9th house interpretations? Other house interpretations can be viewed here. Want to know more about the Twelve Houses? By Howard Sasportas. 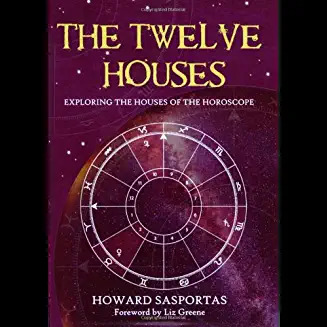 This is a study of the symbolism of the 12 astrological houses, which represent the areas of life in which human existence unfolds: personality, values, communication, work, hobbies, couples, travel, the objectives, the outstanding issues and so on. The book also presents information on the meaning of the houses, as well as the locations of the planets and signs in each of them. © 2010-2018 JKS Astrology - All Rights Reserved.